great post ! I can’t wait to see what your working on! Thanks Kevin, you’ll be hearing about it shortly – stay tuned! I can so relate Hans! Most of us were sold a bill of goods about what the American Dream is supposed to look like then we find ourselves trapped. Breaking free and showing others how to do the same is Priceless. Great post! It was a trap, I’ll perhaps create another blog post about why we were sold the old American Dream (and who’s dream it really was for us all to fall into the trap…) but in knowing there is a way out, a way we can still achieve the real American Dream of freedom is empowering and exciting. More on that to come soon! Hey Hans a great post and I agree that the American Dream should die, the old that is also. You did a great job of stating some nice facts that one can relate to, with sharing your experience with your own home and the cost associated with it. but you also touch on a different and better way and hate the video that is coming soon, where I clicked it just to see if it was real or not that was great looking forward to seeing that video. Hey Dan, lol. That wasn’t actually my intention, you can credit YouTube for that one. Guess YouTube wanted to add some suspense and keep you from seeing that video. It is a short intro to what is coming. You can find it on my YouTube channel if you like at http://youtube.com/hanstheschoff – thanks! This is an interesting concept — eager to hear more about it. Many years ago — probably before you were born — in the 70s, there was a movement to live off the grid. Of course it didn’t spread very far because of our value on consumerism. Will go to your youtube channel to see the video. Hey Carol, glad to hear from you. The Off-grid is movement is picking up again as well; These Tiny House on Wheels setups can make it very doable to go off-grid and require no 3rd party electric, plumbing or sewage services. Another great way to save some money and be even more free! 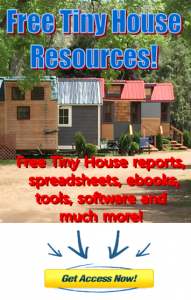 Pingback: » What is a Tiny Home?